Armed with my doctor’s blessing and the most intense item of running apparel I’ve ever owned, I did it. The conditions were perfect, I had gorgeous weather and a sleeping baby. But not even a crisp fall day could change this fact: it was hard. 2) to run an 8k on November 12. My plan was to walk a block, run a block. When your goal is completion (like mine is), you’ve gotta come up with plans like that so you don’t tire out too soon. Even though the part of me that thought running would be a piece of cake wanted to just take off, I paced myself. For me the pace was painful, for him the pace was painfully slow. Take off, jack rabbit. In all honesty it wasn’t that bad. Second, I’d think about the finisher’s medal for the 8k. Call me juvenile, but I love medals, and the 8k is one of the few races where finishers get medals. I know I don’t REALLY win my medal, but crossing the finish line and getting nothing but a bottle of water is a little anti-climactic, dontcha think? Medals are way cooler. Whenever I get a finisher’s medal I wear it all day. 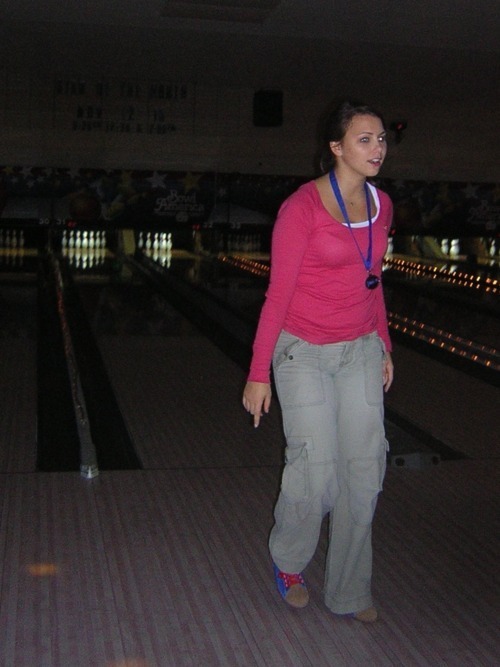 If you ever see me wearing a medal say, at a bowling alley, it’s not because I won some bowling prize. It’s cause I ran a race that day. Hey, I earned it. Anyway, I imagined impressed pedestrians and thought about that medal. This is the take-away: you’ve gotta do what you’ve gotta do to keep putting one foot in front of the other. That’s the number one rule of running no matter who you are. I switched to running two blocks and walking one because, all things considered, I felt pretty decent. I ran/walked 1.91 miles in 25:42. That’s a little slower than 13 minutes a mile. In case you’re wondering, Tom came home from his 4-mile run not too long after I finished running 1.9. He’s twice as fast as me. However, he didn’t carry and give birth to our son, but who’s counting? Right now my plan is to run three times a week and increase my run about a mile a week until I hit 5 miles. Somehow I’ll also work on adding to my running time as well (as in, more running, less walking). The 8k is more than a month away, so that gives me plenty of time with a week or so to spare. If you are a famous running coach and think that sounds like a horrible plan, please let me know. I’m open to suggestions.